Dr. Valeri Sacknoff is a member of the American Academy of Cosmetic Dentistry and has been consistently recognized as a “Top Dentist” in San Diego. At Pomerado Cosmetic Dentistry, our repertoire of procedures and treatments extends beyond cosmetic and restorative dentistry. Our team provides advanced dental care options to address a variety of needs. In addition to a range of general and preventative care procedures, our dentists offer sleep apnea and snoring treatment, techniques to alleviate dental anxiety, and an array of options for children, senior citizens, and everyone in-between. For decades, we have been dedicated to helping our patients improve their health and well-being, and these treatments are just the tip of the iceberg. To learn more about our advanced dental services, please click the links below. We look forward to speaking with you soon. Improving our patients’ oral health is our number one goal at Pomerado Cosmetic Dentistry. Our general and preventative care treatments include tooth-colored fillings, protective sealants to prevent cavities, and options such as oral cancer screenings, root canal therapy, and periodontal care. When a tooth has been structurally damaged a root canal is sometimes the recommended treatment. However, in some cases, we can forgo the use of invasive procedures and instead opt for biomimetic dentistry. These long-lasting biomimetic materials are tooth-colored and can preserve and protect your tooth from further damage. They are designed to mimic the function of the tooth and do so with flexible material. A dental emergency, such as a damaged or missing tooth, severe pain, or other urgent concern, can often elicit panic if you are unsure of how to handle the situation. Our team of skilled dental professionals is here to help. We understand that you will likely need a quick evaluation and treatment plan in the event of a dental emergency. Our goal is to get you the best possible care, either through our office or a specialist who can work efficiently to address the problem. We are happy to offer pediatric services at our dental practice. To help your child become accustomed to our office, we try and approach their treatment in a fun and creative way, while still being thorough and effective. Our goal is to put children at ease and create a space they feel comfortable being in. Our pediatric dental treatments range from cleanings and exams to preventative care and many others. As the body ages, a decline in the health of one’s teeth and gums is very common. This deterioration can manifest in various forms, including tooth discoloration, gum disease, and decaying teeth. Our dental practice offers a variety of treatments to help senior patients gain control of their oral health, and we work with them to uncover issues that may not be quite so obvious. Above all, we treat each of our patients with kindness and respect so that every visit with our team can be a positive experience. Our dental team knows that visiting the dentist is not every patient’s favorite task. Many individuals suffer from some form of dental anxiety, which can prohibit them from receiving the care they need. We offer various types of sedation dentistry to ease fears and keep patients calm and relaxed during their appointment. 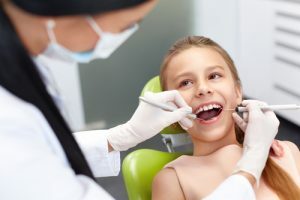 If strange smells, sounds made by dental instruments, potential discomfort, or concerns about needles make you nervous about treatment, one of our sedation dentistry techniques may be beneficial. Our team can utilize advanced laser dentistry techniques to help make certain procedures more precise and comfortable. Laser light energy can be used to target diseased tissues while leaving healthy tissues unharmed. This technology can also help reduce the potential of bleeding and swelling. Snoring is a common indicator of sleep apnea. Sleep apnea is a disorder that should be taken very seriously as it poses considerable life-threatening risks that stem from breathing pauses in the sleep cycle. Our team has received advanced training in the field of sleep medicine and can help you obtain the solution you need to reduce the many health risks associated with this common condition. TMJ Disorder, or temporomandibular joint disorder, is a jaw condition that is often associated with symptoms such as limited mobility, popping or clicking noises, or chronic facial pain. Patients who suffer from TMJ Disorder may also experience headaches, dizziness, or ear aches. At our dental practice, we offer treatment options such as customized oral appliances and other therapies designed to provide relief. As the field of dentistry continually advances, our practice is committed to remaining at the forefront of the industry. We believe that effective dentistry blends science, art, and technology to create beautifully healthy teeth and gums. Our innovative technology helps us to provide more precise and comfortable treatment while creating exceptional, long-lasting results. For more information on our advanced dental care services, or if you would like to schedule an appointment, please contact us today.